Burns Organic Fish & Brown Rice is a unique, nutritionally balanced dog food with all the added benefits of organic ingredients. These include organic rice, barley and fish meal to help lubricate joints, provide dental and mobility support and aid in urinary-tract complaints. The recipe has a high fibre, low fat content and is perfect for hypersensitive dogs, due to its wheat and dairy-free composition. 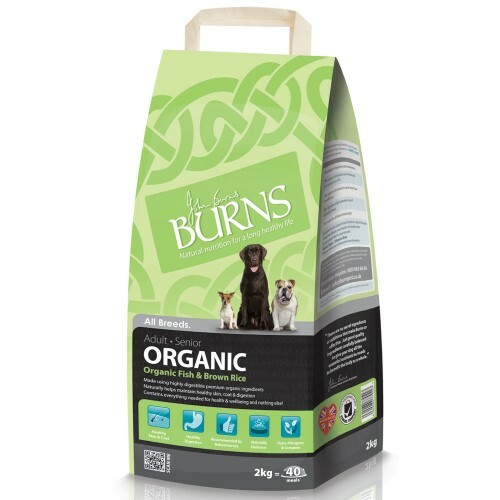 Burns Organic dog food is suitable for adult and senior dogs over 9 months old. Organic Brown Rice (33.61%), Organic Oats (23.15%), Organic Barley (18.98%), Organic Fish Meal (18.52%), Salmon Oil (3.70%), Organic Sunflower Oil (1.39%), Vitamins & Minerals. There are currently no questions for Burns Organic Fish & Brown Rice Adult & Senior Dog Food - be the first to ask one!